Today marks the last day of the monastic summer retreat - Yarney. 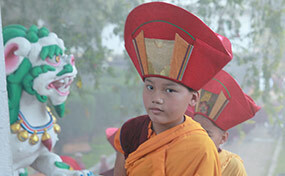 After circumambulating the Boudhanath Stupa, a group picture was taken, Rinpoche entertained the young monks. Construction of 55 houses is coming along very well! 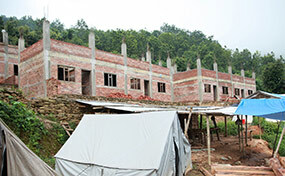 Rangjung Yeshe Shenpen, a non-profit social work organization founded by Chokyi Nyima Rinpoche, has been supporting intensively construction of 55 houses as part of it's earthquake relief project in a rural area of Nepal. Close to the end of the yearly monastic summer retreat - Yarney - the monks of Ka-Nying Shedrub Ling display their achievements of study and debate in front of the whole assembly. On the 20th of August, 2016; the year 2143 on the 17th of the 6th month of the lunar calendar, the fourth Kyabje Tsikey Chokling Rinpoche’s (Mingyur Dewey Dorje) Long Life ceremony (Tenshuk) was offered at the Paro Kyichu Lhakhang, Bhutan by Kyabje Dilgo Khyentse Yangsi Rinpoche and Kyabje Phakchok Rinpoche. 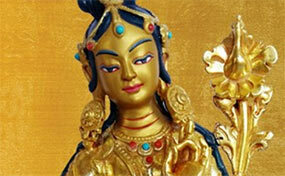 Kagyu Gyurtso chants (Rain of Wisdom), a collection of songs of realization from the Ocean of Kagyu Songs. On 8th September, India's Ambassador to Nepal, H.E. 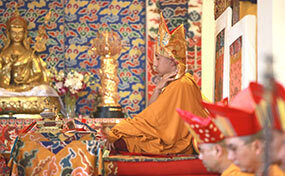 Ranjit Rae, visited Chokyi Nyima Rinpoche at Ka-Nying Shedrub Ling Monastery in Boudhanath. Over a two hour period the Ambassador toured the monastery inspecting damage caused by the 2015 earthquakes and met with Rinpoche to discuss matters of common concern including Buddhism in India and the spread of Dharma around the world. 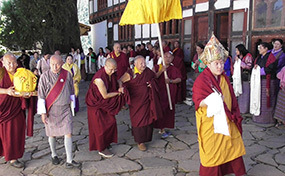 This year, a Guru Rinpoche year, a couple of nine day long Barchey Kunsel Mandala Drubchens were held at various locations, today one ended at Ka-Nying Shedrub Ling Monastery. At the same occasion five vessels filled with Tibetan special medicine (Men-drub), were blessed and offered to all participants. These days the Mexican Sangha has the fortune and joy of having Rinpoche inaugurate the Dharma House in Mexico City and giving four days of wonderful teachings. Based on Chokyi Nyima Rinpoche’s encouragement, Tara’s Triple Excellence participants as well as practitioners around the world can now purchase high quality practice materials that have been carefully selected by senior Lamas of Ka-Nying Shedrub Ling Monastery and blessed by Rinpoche. 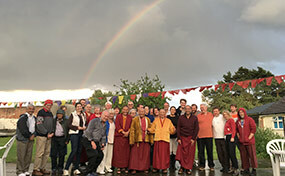 August 6th, on the special day of Buddha Shakjamuni's first turning of the Wheel of Dharma, Chokyi Nyima Rinpoche inaugurated a new Stupa in Gomde Germany - Austria's Wisdom Garden. 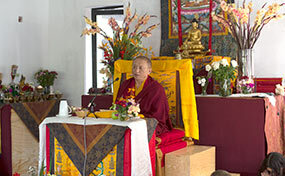 Chokyi Nyima Rinpoche's seminar at Gomde Lindholme just ended and some very exciting events took place. Permission for building a temple is about to be granted, the last obstacle has dissolved. Today, on the full moon day of the auspicious month of Saga Dawa, Chokyi Nyima Rinpoche presided over a Ngakso Puja at Gomde Lindolme, UK.